"May I rent the ballroom for my wedding?" Oh, how we wish we could! Someday, friends, someday. We need to raise about $1,000,000 to restore our gorgeous (in our vision) ballroom to its former glory. Short term, we are working on rental agreements so we can offer our retail and performance spaces. We are not yet ready to offer rental arrangements, but watch this space for updates on our progress to that goal. 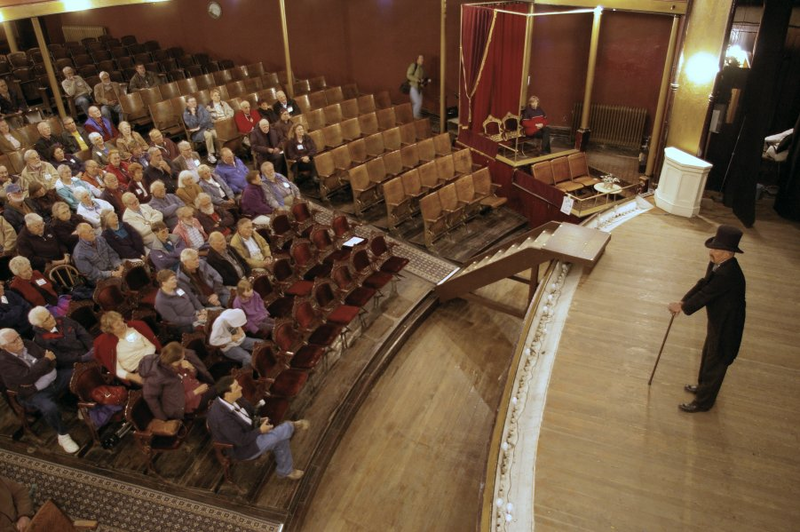 Our beautiful historic performance hall seats 400 downstairs. Soon we hope to be able to offer rental access to this space for private events. Watch for updates on rental access! After completion of our $10 million rehabilitation, we will be able to offer access to our balcony, which seats an additional 300. The performance hall is available to rent to groups, businesses and special event organizations. Will be available in the future for rental for requiring seating or open space for up to 100 people. Chairs, tables, A/V and microphones available. Free access during our regular hours for select non-profits, creatives, musicians and local micro-businesses on an as-available basis with appropriate notice. Will be available in the future for rental for events requiring seating or open space for up to 50 people. Chairs, tables, A/V equipment and microphones available. Free access during our regular hours for select non-profits, creatives, musicians and local micro-businesses on an as-available basis with appropriate notice. Please sign up in order to receive periodic updates and news from The Tabor Opera House, including upcoming performances. We value your privacy and will not share your email address. Copyright 2018 Tabor Opera House Preservation Foundation, Inc. This project has been funded in part by a grant from the Gossard Fund for Colorado of the National Trust for Historic Preservation.